Aviation Updates Philippines - The Philippines' leading carrier, Cebu Pacific Air (PSE: CEB) took delivery of its 59th aircraft last February 28, 2017. This new ATR 72-600 is the fourth of the 16 firm orders CEB made last year. THIRD ATR 72-600 IN THE FLEET. 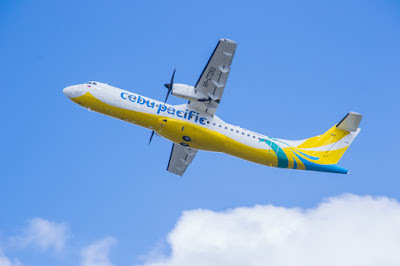 Cebu Pacific with its subsidiary Cebgo received its third ATR 72-600 aircraft from Toulouse, France. The aircraft can carry up to 78 seats and boasts its improved systems compared to the ATR 72-500. Photo by Ajig Ibasco. This brand-new ATR 72-600 will be used to support the company's expansion as CEB, through its wholly-owned subsidiary Cebgo, will be launching two new routes this March 15 2017: Cagayan de Oro to Bacolod and Cagayan de Oro to Tagbilaran. "We are eager to receive yet another addition to our ATR fleet, supporting our expansion plans in the archipelago. CEB remains committed to further increase inter-island connectivity within the Philippines, to serve not only our kababayans but also tourists who wish to explore the country's beautiful islands and experience the world-renowned Filipino hospitality," said Alexander Lao, President and CEO of Cebgo. "Rest assured, we will continue making more destinations accessible to everyJuan while consistently providing our trademark low fares, paired with our safe and fun service" added Lao. CEB currently offers flights to a total of 37 domestic and 29 international destinations, operating an extensive network across Asia, Australia, the Middle East, and USA. Its 59-strong fleet is comprised of four Airbus A319, 36 Airbus A320, seven Airbus A330, eight ATR 72-500, and four ATR 72-600 aircraft. Between 2017 and 2021, CEB expects delivery of one more brand-new Airbus A330, 32 Airbus A321neo, and 12 ATR 72-600 aircraft. Cebu Air, Inc. is the largest carrier in the Philippine air transportation industry, offering its low-cost services to more destinations and routes with higher flight frequency within the Philippines than any other airline.